Los Angeles represents a diverse community, spanning a spectrum of people from all walks of life. A hubbub of activity and an apex for pop culture, Los Angeles is often a target of the media. People pay attention to what goes on in Los Angeles – and a lot of what they focus on are Hollywood romances. These public pairings seem to have a unique and timeless attraction all their own, and capture the spotlights and the hearts of many. Will they succeed despite the pressure of society? This is often the pinnacle question. 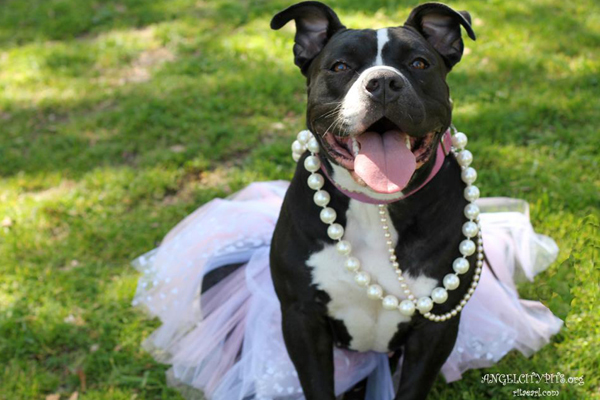 For Angel City Pit Bulls, life in Los Angeles never skips a beat. Much like our celebrity inhabitants, we deal with many of these same things. Pit bulls are no strangers to media attention; in fact, they are often at its epicenter. And thanks to a lot of byproduct and hype, pit bulls in our community face a lot of hardships. Like anyone under a constant spotlight, the many misperceptions and myths that are perpetuated by the media make life challenging for your average Los Angeles pit bull. 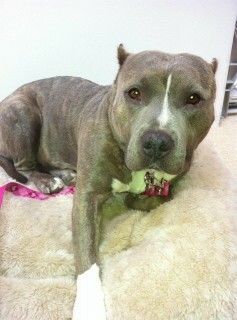 This is where Angel City Pit Bulls comes in, and our passion is put to work. 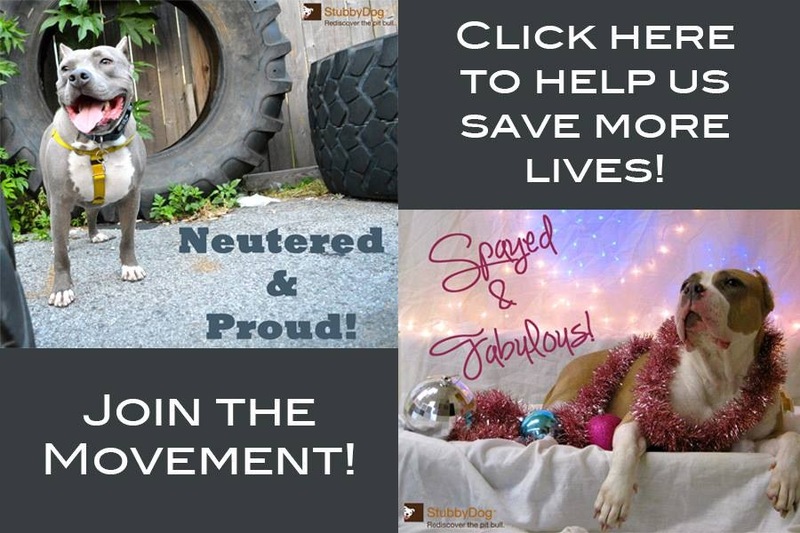 Our mission is to educate, advocate and celebrate everything that is pit bull – and we do just that in myriad ways. We educate by teaching the public about the true nature of the breed, by bringing our dogs into classrooms filled with eager children and by showcasing our ambassadors to the public at every opportunity. We advocate by working hand in hand with our community animal shelters, teaching their staff and volunteers about how to work with pit bulls, and providing tools to help more and more of them find loving homes. We celebrate each and every Los Angeles pit bull – those that we are able to help on their journey, as well as those who we unfortunately cannot. 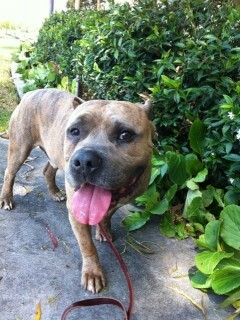 There are so many that wind up in our shelters; that is where the term Angel City Pit Bulls derives its double meaning. They are all angels in our eyes; some get to walk alongside us, while others earn their wings prematurely. As long as so many of them are falling on the kind of bad luck that ends their lives abruptly, unfairly and far too soon, we have our work cut out for us. A labor of love, but not without heartache as well – it is the many we have loved and lost whom we honor and look upon to provide us the strength to persevere. 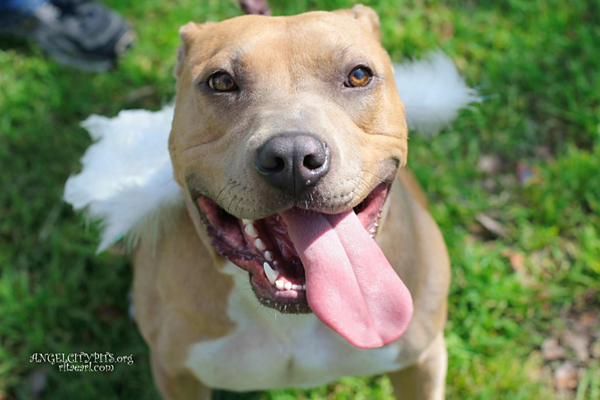 What is an Angel City Pit Bull? He is the sweet young stray dropped off at the shelter, suffering from disease and malnutrition. She is the healthy female, past her prime as a breeding machine, abandoned by her profiteers. She is the beautiful young puppy, one too many in an unplanned litter for which no provisions were made. He is the handsome senior, having slowed a bit and despite years of providing only unwavering love and devotion, is found to now be merely an unwanted nuisance. We take them, as many as we can – through the generosity of charitable support and the steadfast hearts of our team of volunteers, we take them, one by one. We tend to their medical needs, we fill their empty bellies, but perhaps most importantly – we mend their broken hearts. Sometimes, an Angel City Pit Bull is one in the dimming twilight of life – suffering from terminal illness or irremediable pain. We take them, too. For us, a forever home doesn’t necessarily always mean finding an adopter – sometimes, it means providing the compassion and dignity for a dog that has been abandoned soon before reaching life’s end. We embrace their hearts at the cost of devastating of our own, but we wouldn’t have it any other way. Some wonder why we do this – for us, the answer is easy. We do it because we care. We do it because they need us. We do it because they deserve the best we have to give. We think of the ones we’ve lost, imagining them watching over us … we owe it to them. We refuse to let them down. Angel City Pit Bulls are dogs like Pippa; in one of our recent class sessions held at a Los Angeles shelter, teaching an army of volunteers how to work with dogs in their care, we came across a soulful, middle-aged gal with pleading eyes and a gentle spirit. Her time was almost up, and with her cropped ears and brindle coat, not much promise for adoption lay before her. We saw something different, however, beneath her exterior; we saw the heart of a beauty queen who would soon capture the affections of everyone she came across. Bad knees required surgery to repair, but it wasn’t long before she was proudly strutting her way through adoption events, shopping malls and beachside walkways – and eventually, right up the steps into her forever home. Pippa is destined to be a therapy dog someday; her intelligence shines through every healing step she takes. Her adopters know the gem that she truly is – when finalizing the details, several families lined up to adopt Pippa, should they have changed their minds – quite a paradigm shift from where Pippa first came from. Smarts run in the family; with one human parent from Harvard and the other from Stanford, Pippa fits right in – her journey is destined to continue to educate the hearts and minds of everyone she meets. Then there are dogs like Wilbur, a sweet senior gentleman who had only known life in a yard before winding up in a shelter, through no fault of his own. With a bad tooth, an eye that needed repair and an intimidating physical appearance, things didn’t look good for poor Wilbur. That all changed when Angel City Pit Bulls came in … with a few small surgical repairs and a few more sweet nothings, Wilbur’s true disposition emerged. He has yet to meet a lady that doesn’t swoon over him – including his foster mother. The work of a foster is pinnacle to our organization; having already provided a safe haven for numerous other dogs prior to Wilbur’s arrival, the unique connection that she made with Wilbur could not be denied. It seems that while Wilbur’s foster mom was busy healing his heart, he was fast at work stealing hers; it wasn’t long before it was made official and Wilbur’s new life of good living by the sea officially began. Soon he’ll be a therapy dog, too – and will get to share his special brand of gentlemanly kindness with others. These are the love stories we see writing themselves every day. After all, Wilbur and Pippa do have a few things in common … they have both undergone a little bit of “plastic surgery,” have been featured in local rags and have even both made appearances on television! These romances are a little different than what you may see on the screen or read about in the pages of gossip magazines, however – where so many sadly fall victim to the effects of a critical and unforgiving media spotlight. Wilbur and Pippa have sustained … and despite the attention, have not lost sight of what is important. They may have their own run-ins with the paparazzi, stealing photos of their every kiss … despite that, they know how to live in the moment and appreciate all that they have been given. Most of all, they know that they both have a lot of important work left to do here in this life. There are perceptions yet to correct, myths to dispel and hearts yet to win over. 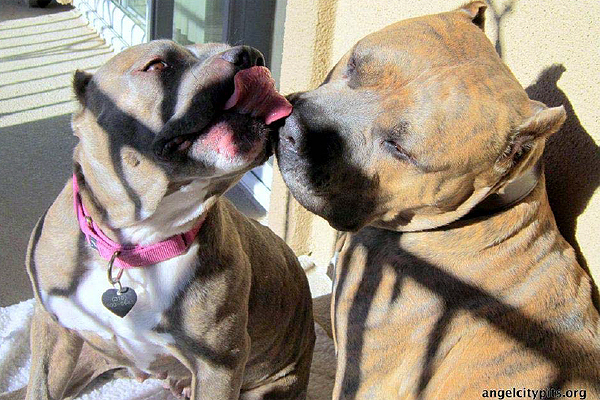 We at Angel City Pit Bulls, well … we feel like the lucky ones, for our front-row seats in their blossoming romance. Love stories like these make this world a better place – not just for them, Wilbur and Pippa – but even more so because of them. There are romances like these everywhere just waiting to bloom. When you think about it, these are the kinds of romances that we all want, deep down, and spend much of our lives in search of … the kind that are sure to succeed. Don’t be fooled, these matches aren’t only made in Hollywood. Go and see for yourself; put down your magazines, turn off the television, and visit your local animal shelter. You will soon realize that Angel City is not the only place full of these angels in waiting. As the saying goes … you can’t buy love … but, you sure can adopt it. A shelter dog romance? It’s a bestseller, every time. Be a part of writing the romances of tomorrow, by opening your hearts to them today. I have tears in my eyes after reading this. My pit bull, Herman, recently went to wait for me in heaven. I always referred to Herman as my “angel” and still do. Thank you for for what you do. @Matt.S We are so sorry for your loss Matt, we know how hard it is to lose our loved ones. Herman will always be your angel and it sounds like you were both blessed. @StubbyDog. Thank you. I just sat down at the cafe that always welcomed Herman and treated my angel like family. @StubbyDog. I’m definitely blessed. Herman had a pit pappa who will always love him! This is a beautifully written post, with wonderful pictures, to boot. Thank you Angel City Pit Bulls, for all that you do! Angels are everywhere….and there seems to be a wonderful group in LA. Heartfelt appreciation for all the hard work and love you share with these awesome creatures!